We use Canon cameras and Apple computers at The Daily News and in what seems to be a common paradox among photographers I know, we like Lexar card readers but exclusively use SanDisk flash cards. 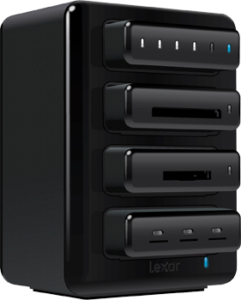 I also tested a brand new SanDisk reader and our previous reader of choice, the Lexar Professional FireWire 800 CompactFlash Card Reader, to see how they compared. As expected, the CFast cards on Thunderbolt 2 are by far the fastest. However I was surprised by how big of a hit the transfer speed took when utilizing the HR2 hub. It is especially convenient sitting on my desk at the office but I see no reason to drag it out into the field on assignment. While still twice as fast as using CompactFlash cards, if you are in a really big hurry skip the hub and connect directly to your computer. As you can see the old venerable FW800 reader gets easily trounced by the newer readers and will immediately get relegated to backup status. Hopefully these results were useful, feel free to let me know if you have any thoughts.